It took some time but finally here it is! Hope you enjoy watching it! P.S. Fatimah arrived at Schiphol on Wednesday, so two days later than most of our group. So, she is not stuck in the harbor. Good to know! 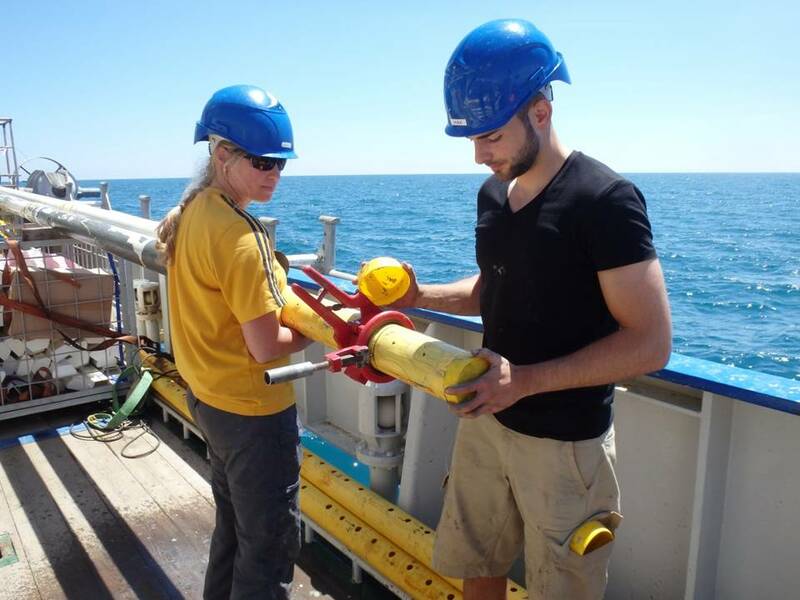 On the last few days of the cruise, we continued our routine with coring and water column sampling. As the schedule became slightly less intense, some of us finally had time to write the cruise report. That resulted in a 140 pages thick report which includes the methods, core descriptions and the first results. On Friday, there was also another important event awaiting us; Lorendz turned 40! To celebrate this important moment in history, we made a special cart with pictures of all cruise members. These pictures, except Lorendz, were photoshopped with an aging app, so we could compliment Lorendz with his young look. 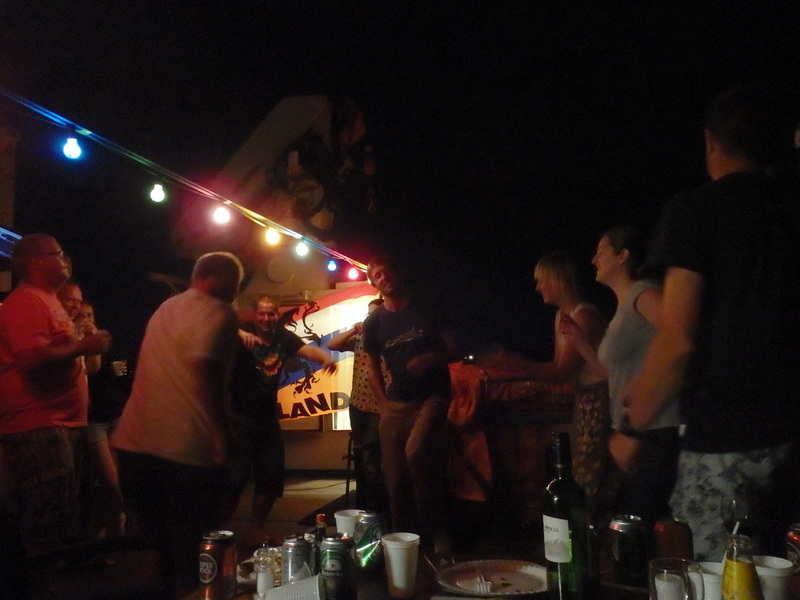 We had a nice BBQ and ended the night with some fishing and dancing. 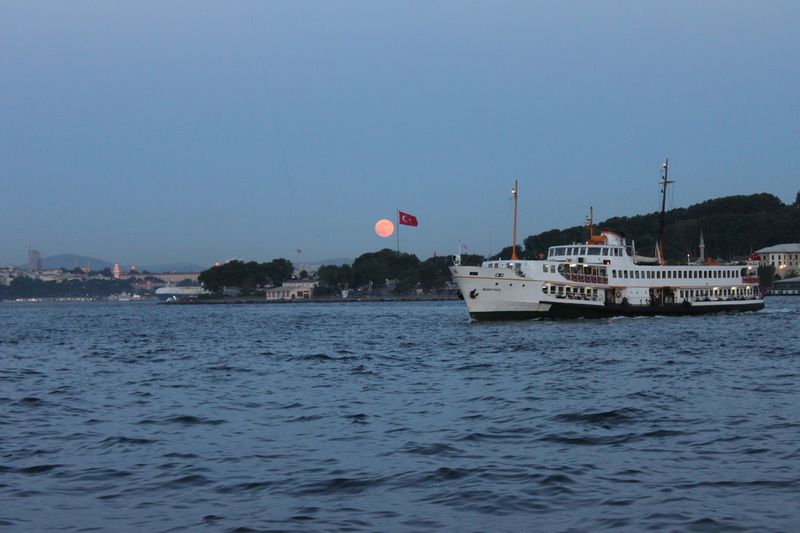 On saturday we returned to the Bosporus. Here, we were accompanied by playfull dolphins which kept on swimming in front of the ship. 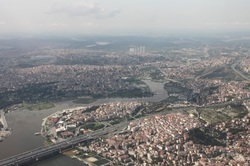 In the morning, we arrived in Istanbul. After packing and cleaning the whole day, we got a permit to go out of the harbor into Istanbul. Although it was quite strange to walk on land again, nobody was landsick. 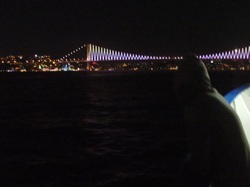 With the company of some beer and raki we watched the full moon in a bar located under the bridge over the Golden Horn. Afterwards, Mustafa guided us to the neigboorhood around the Galata tower and we went to a rooftop terrace in Kadikoy. We ended the night with some traditional Turkish soup. Yesterday, most people flew back home. Unfortunately, Fatimah has issues with entering Turkey with her Nigerian passport and needs to stay on board of the Pelagia in Istanbul until everything is arranged. Hopefully, she can leave the harbor today to fly back to the Netherlands. At home, we can finally have some rest and time to look back on this succesful cruise. We obtained a lot of data during this cruise, which will tell us more about the ocean anoxia and it's relation with geochemical cycles. We would also like to thank everyone for the nice vibe on board of the ship. The labeling parties and dancing during glovebox subsampling sessions made the hard work much lighter. as we are trying to make a movie about the cruise! gentlemen, we bring you sediment traps! valuable information, also because the equipment itself is very, very pricy. do now is wait for about a year and hope everything went well. Let's relax for a minute! Despite the exotic name, the Eemian is not a mythical deep sea monster or a Byzantine shipwreck... although both may be waiting to be found in the unexplored depths of the Black Sea... it is a period of time recorded by an unusual sediment layer buried deep under the seafloor below our ship Pelagia. The problem with the Eemian layer is that it was deposited 125 thousand years ago and has since been buried under a thick stack of sediments laid down during the Ice Age, when the Black Sea was a large lake. Scientists know that the layer is under there, somewhere, but until now only a few research vessels have been able to recover samples of it. 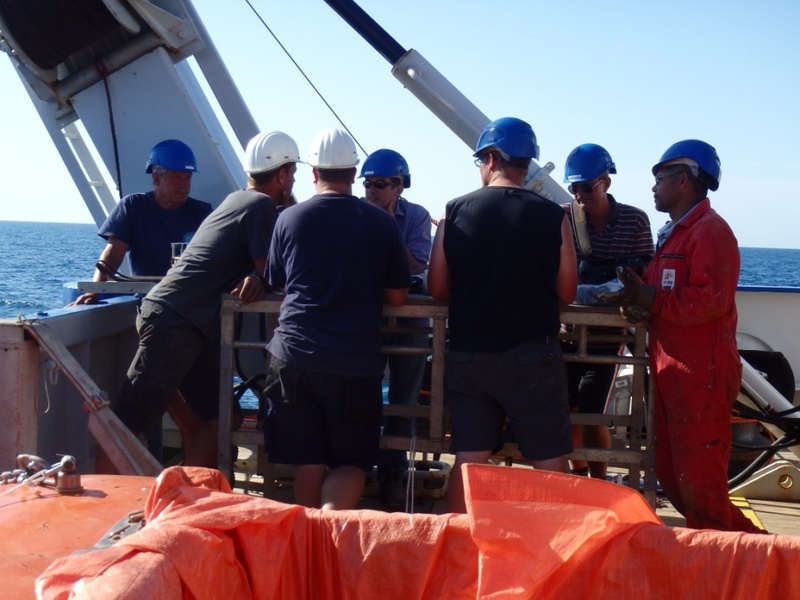 To give us the best chance of reaching the Eemian layer - and being able to answer questions about the climate of this region during its deposition - the crew rigged up a special 18 meter long 'piston corer', equipped with a 1 tonne weight to penetrate deep into the sediments. Suspense built during the day as the time for coring approached. Chief scientist Gert-Jan opened bets at 20 Turkish lira (or a nightshift in the cool container) over whether or not we would find the layer. After the successes of recent days a few optimists raised their heads, but our Romanian geology expert Sliviu was more cautious... "no chance", he said with a smile. So, around 3 pm the core finally came on deck. 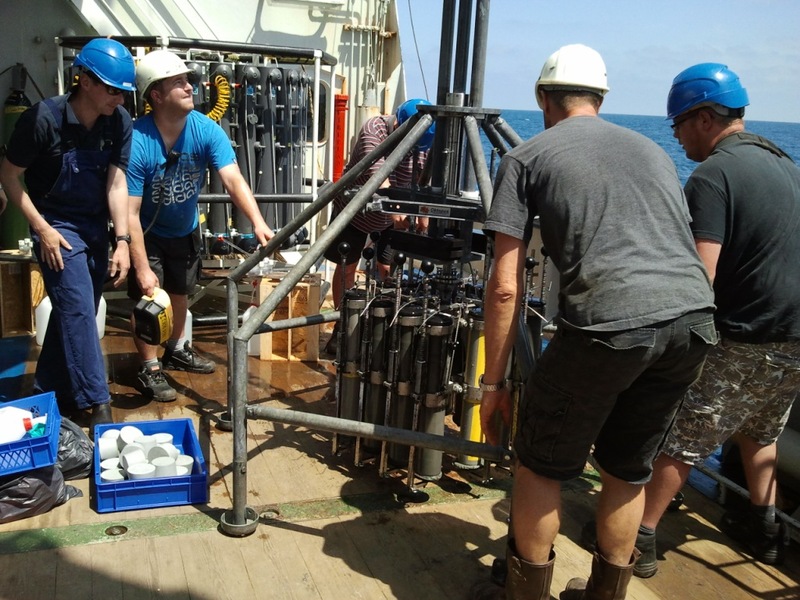 Eveline, Lorendz, Henk, Jan-Dirk and Gert-Jan tried their best to push the plastic core liner out of the piston corer so we could open it up and search for the Eemian layer. After a lot of huff and puff, the piston core was opened up. One meter at a time, we cut the core open and hunted for the dark layer of organic-rich sediments which is the trademark of the Eemian. Meter after meter were opened, each containing plenty of grey lake sediments but NO SIGN of our target layer. Unfortunately it looks like the outflow of the Danube has deposited so much material over the last 125 thousand years that the Eemian is just too deep for our corer to reach. So Silviu was right. But even he was delighted to find a sequence of layered lake sediments (left) which might still be used to investigate climate change during the Ice Age itself. The exhaustion of the day was too much for some, including Peter who fell asleep at the bar with his hand in a box of peanuts. In the coming days the optimists among us will get another shot at glory as we sail further from the influence of the Danube and try again to find the Eemian at deeper stations in the open Black Sea. Where do you sleep? What do you eat? These questions are often asked when we tell people about the cruise. So, let me introduce you to the life on board in more detail. At this moment 31 people are eating, sleeping and working on the Pelagia. Due to the size of the group, some cabins are shared. I share a room with Eveline. In the morning, breakfast is served from 7 until 8 in the morning. This is a Dutchy meal with bread, cheese and chocolate sprinkles. We have the main meal around 12 o‘clock. The chef already made pastas, soups, salads, smashed potatoes and much more. Normally we end it with a nice dessert; especially Fatimah enjoyed the chocolate mousse. In the evening at 6 there is bread again with a small hot dish. Thanks Iwan (see picture)! If time permits, the evening can be spent in the so-called mess room. That’s also the room where we have our meals. It has a television and a small bar. Or we spend our evenings outside, just enjoying the sunset and/or stars. The unlucky ones spend their evening in the cold container, processing the last of the day’s samples! For those who are keen, there is a sports room on the ship where we can burn off some of the calories from Iwan’s dinners. Matthias and Peter tried it out tonight! 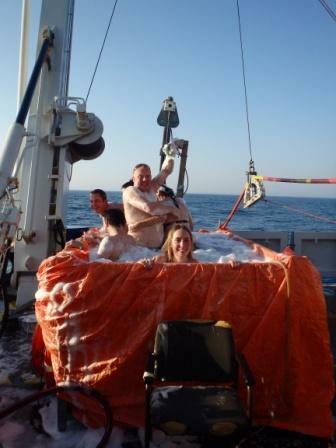 The crew also filled a swimming pool on the deck with Black Sea water and enjoyed a sunset beer. We have now completed the first 5 (and most important) stations of the expedition. We have tens of meters of sediment in the coolers and everyone has been busy with sample processing and measurements. We came close to the coast of Romania today and some of us had telephone network for a while (the first time in 7 days!!). Now we turn back towards the open Black Sea to sample more stations in the deep basin. I finally got some time to update the blog. We have now sampled our key station and the retrieved cores look really nice. The picture also shows the nice laminations in the sediment, indicating changes in the Black sea environments for the last thousand years. Enough interesting stuff is going on in these cores! These cores only include the top 50 cm. 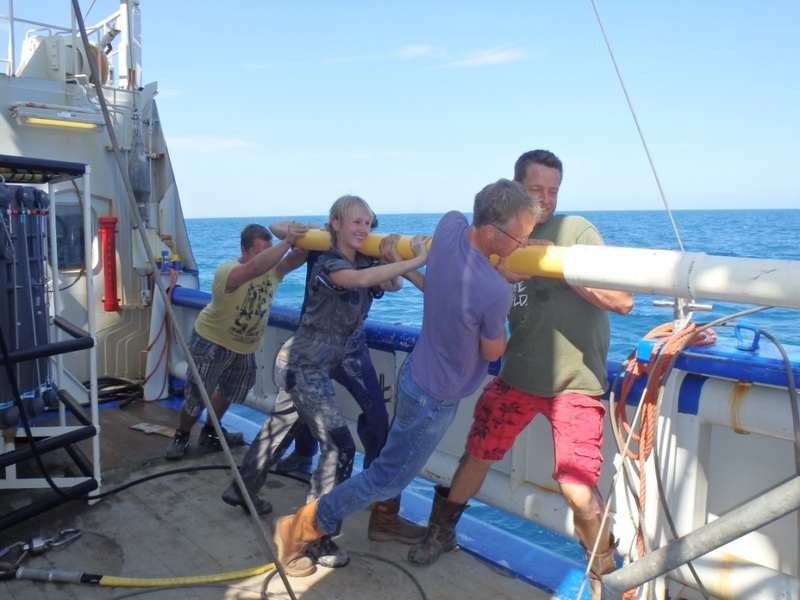 The coring of the deeper sediment went less well as most cores were empty when they arrived on deck. Luckily we retrieved some cores with older sediment in the afternoon. Yesterday, the coring went smoothly. The coring went better. After retrieval, the long cores with 4-5 m of sediment were cut in 1 meter sections by Eveline, Mattias, Iuliana, Gert-Jan and me. These sediment were described by Silviu and Ummuhan. That's a fulltime job as these 5 meters of sediment are described and photographed in detail. Another core was prepared for several chemical analyses by Fatimah, Peter and Tom. This was done by the water temperature of the deep sea, namely 10 degrees, while the temperature outside was around 25 degrees. This results in nice contrast on board; the pictures below were taken at the same time. We have another full program today, including coring and filtrations. Contact with the continents via the internet remains difficult but we will try our best to keep this blog updated. The next time I can hopefully include some pictures of dolphins. We were already lucky twice :). We've been at sea now for two days. 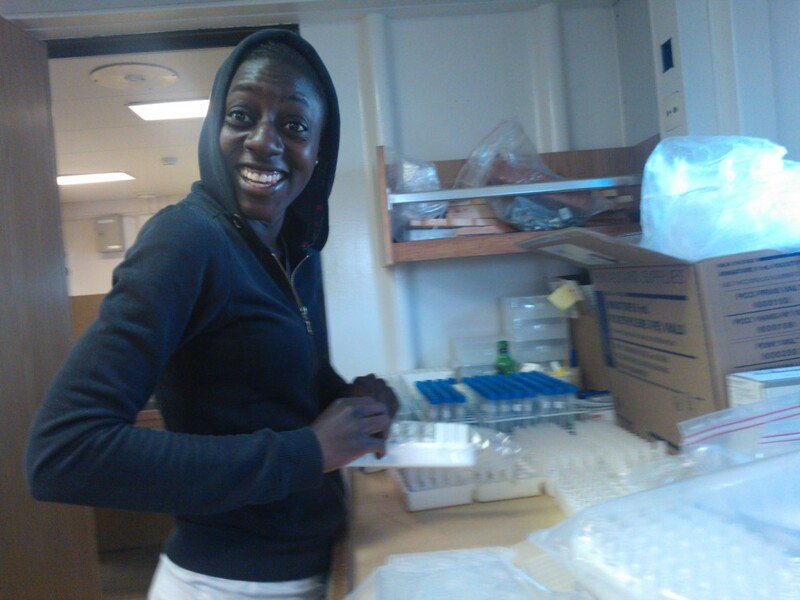 Fatimah is in good spirits and the work is going well! We arrived at our first station over friday night. With all equipment in place, it was time to put our skills to the test. First the structure of the water column at this deep (~ 2000m) site was determined through measurement of important parameters such as temperature, salinity, oxygen, etc. 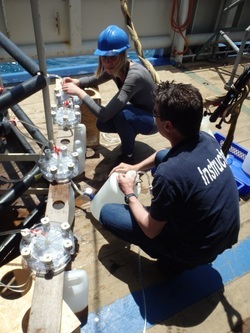 Sure enough, salinity increased and oxygen dramatically decreased between 60 - 80 m.
Together with chief scientist Gert-Jan, Nikki and Peter quickly devised a scheme to sample the water column with emphasis on the oxygen transition zone, after which the first water samples started coming up. Exciting times as we started sampling water from depths between 50 and 2000 m for analysis of both dissolved elements and mineral particles. 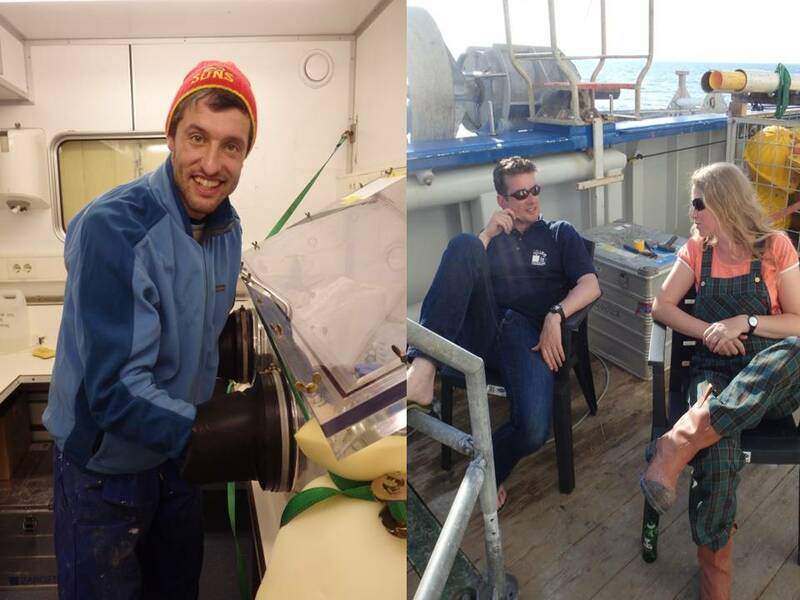 Fatimah, Tom and Matthias had a relaxed start until sediment cores started coming in. 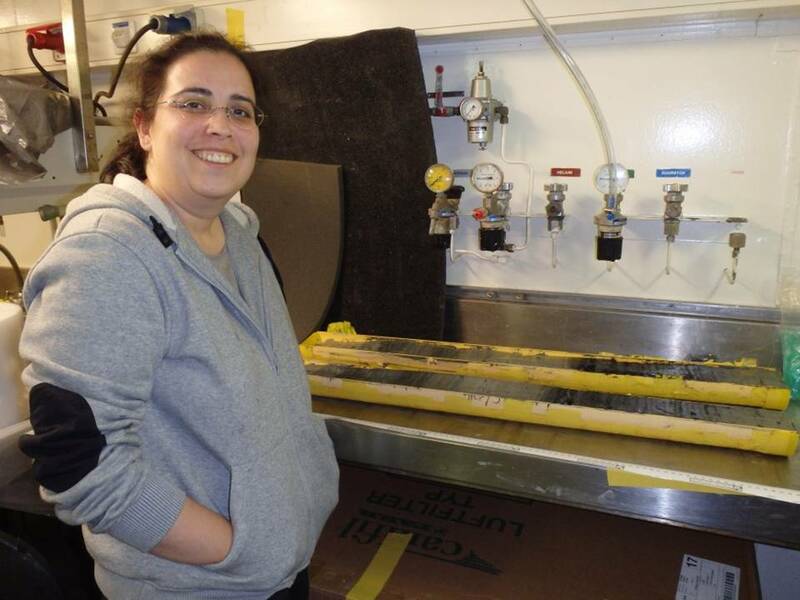 This was their cue for a long day of hard work, dividing the sediment into thin horizontal slices that will be used for an extensive array of dissolved elements and particles. 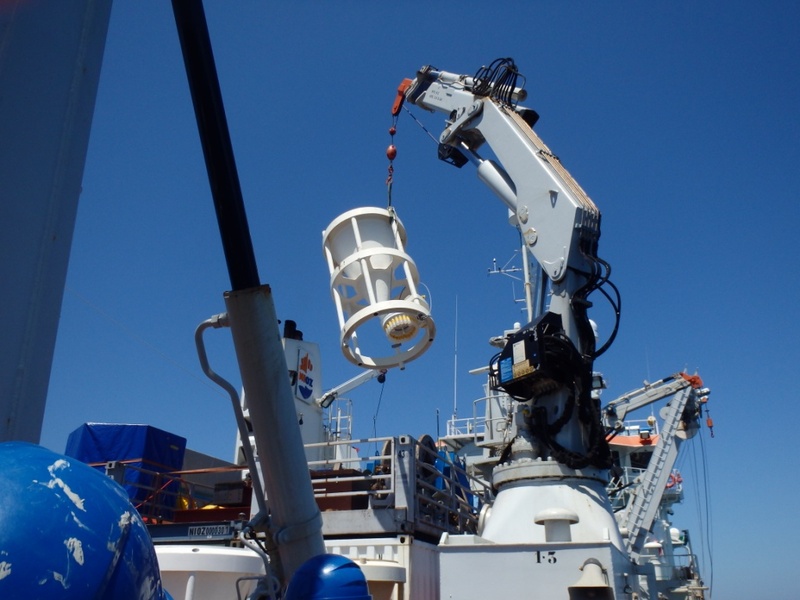 The first cores were about 40 cm long, after which the big guns were deployed: a coring device was lowered up to 7 m into the sediment lying under 2000 m of water. 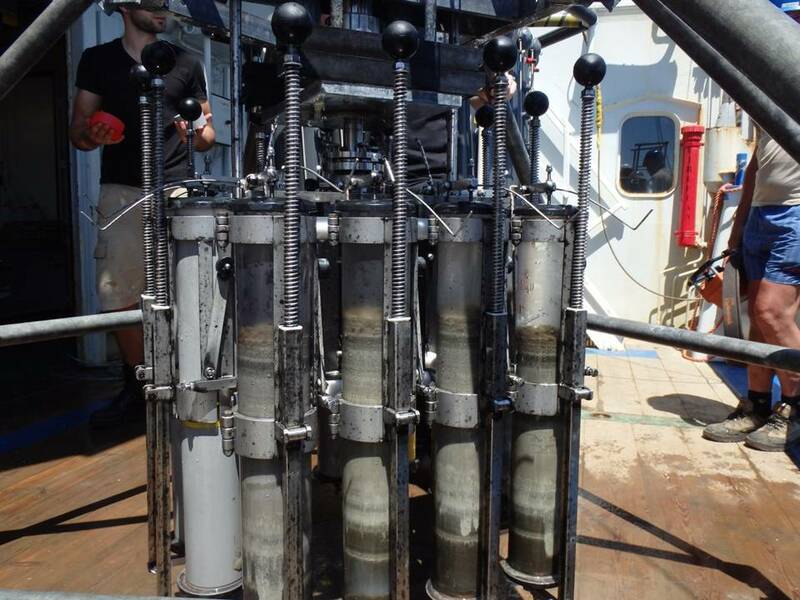 Matthias sampled the core with syringes to analyze methane concentrations in the sediments. This long core will inform us about the longer history of the Black Sea. Once everybody was supplied with water samples or cores, it was time to put our heads down and power through. 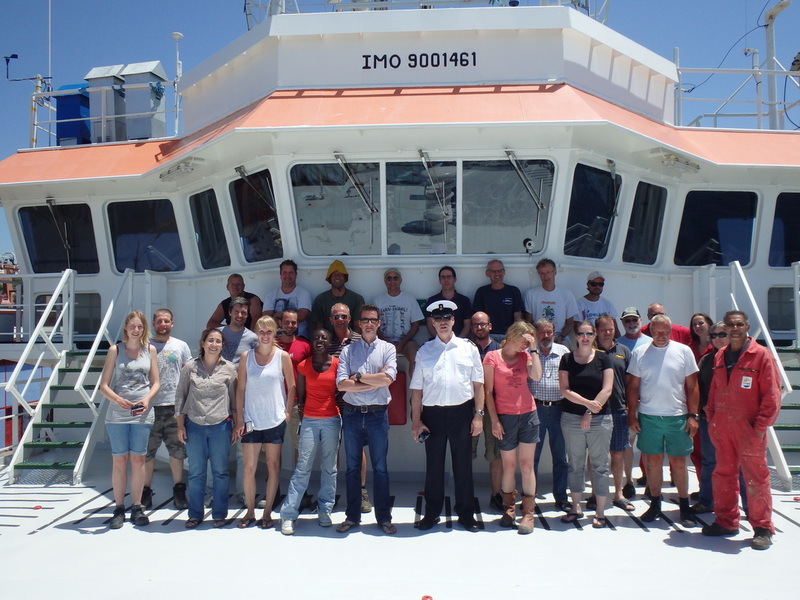 But we were ably assisted by the crew of the Pelagia and the NIOZ technicians. Karel and Sharyn prepared solutions and analysed our water samples, while Henk helped out in between preparations for his seismic surveys. On sunday we arrived at the second station where Iuliana and Eveline started the in-situ pumping of water samples from a range of depths. Tomorrow we will continue here with more coring. This is a key site for the science we are doing. Fingers crossed we get good samples! After the entertainment comes the work. Yesterday we were wandering around Istanbul, admiring the incredible architecture, overwhelming cultural heritage and sheer size of the metropolis. This morning we packed our stuff, got in the vans arranged by our agent and were whisked away to the Istanbul harbor. Here the Pelagia awaited us, as well as all the work associated with getting prepared for the business end of our journey: collecting water column and sediment samples for a whole array of geochemical analyses. Everybody got straight into it: the desired pieces of equipment were located from one of the many crates and set up in the appropriate lab. 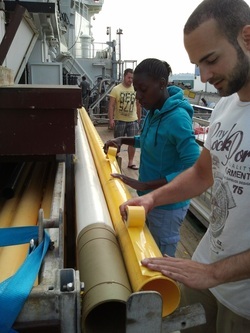 Tom set up oxygen-free chambers and core slicing equipment, Fatimah and Matthias prepared core tubes for methane sampling, and Nikki, Eveline and Iuliana got busy with various filtration apparatus. You name it, we did it. Unpacked and given a temporary home, all this stuff will allow us to unravel the fascinating geochemistry of the Black Sea. Of course, a first day is also about getting familiar with your new surroundings. Safety videos were shown, tours of the ship were given, and the ever helpful crew was flooded with questions and requests for help. The chief engineer Jaap helped us set up our gas supplies, while Lorendz, Jan-Dirk and Sander were on hand to locate core tubing and tools. Slowly but steadily, things have started to shape up. "How may I sell you something you don't need?" Or maybe “Sir, how can I make you give me your money?”…. 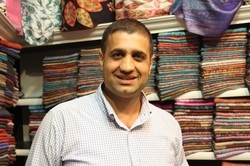 The traders of Istanbul’s Grand Bazaar have centuries of experience in convincing visitors to part with their hard-earned cash. We experienced this, and much more, during our pre-cruise tour of Turkey’s capital city today. We rocked up at Atatürk airport yesterday evening, and after a mammoth 1.5 hr transfer (one long traffic jam from start to finish) we made it to our hotel on the Asian side of the Bosphorus. A quick kebab sloshed down with raki and we were ready for bed… knowing we had only one day to tick off as many tourist destinations as possible before boarding the Pelagia tomorrow. 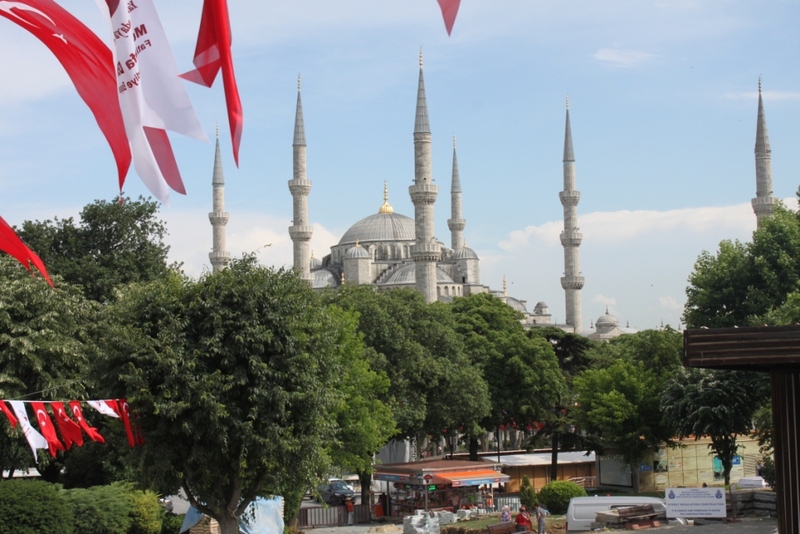 Of course, Taksim Square didn’t quite make the list; but as anyone who has visited Istanbul will tell you, there’s more than enough to see in the old town of Sultanahmed without needing to venture anywhere near the action. So that’s what we did… Aya Sofia, Blue Mosque, and of course, the Grand Bazaar, where Matthias did his best to get a good deal on some treats for special ones back home (no more details just now!!). The combined total of kebabs eaten among the group grew steadily through the day, as we did our best to prepare for the long hard weeks at sea. The best of these were certainly had at the recommended Ciya Sofrasi restaurant back on the Asian shores in Kadiköy. Rough guides do come in handy! Tomorrow we will be picked up at 8 am and taken to the ship, where we will start to prepare the labs in time for departure in the evening. Then we will sail through the Bosphorus and out into the Black Sea towards our first station. We’ll be keeping a keen eye on developments in Turkey before our return on June 23. As promised, I (Nikki) will now tell you something more about the preparations for the cruise! These preparations involved a lot of packing. It’s like going on a huge vacation WITHOUT the ability to buy something abroad in a local store in case you forgot something. This involves packing lists of 12 pages and 13 crates of approximately 0.75 * 0.55 * 0.60 m. These crates were already picked up 1 month ago as at that time the Pelagia already sailed towards Istanbul. Besides preparing our equipment, we also needed to prepare ourselves. This involved a medical test at the Medical Centre for Seamen in Amsterdam where my ears, eyes, weight and reflexes were checked. 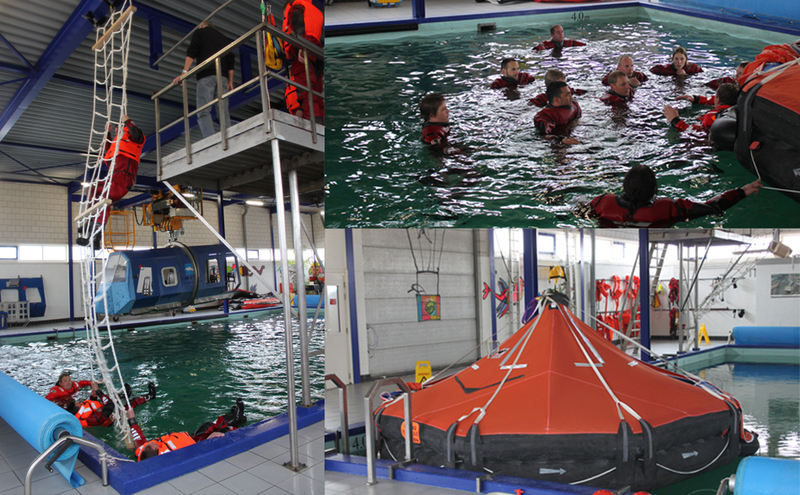 After approval, I did a one-day Survival at Sea training at DHTC Den Helder, together with Matthias. 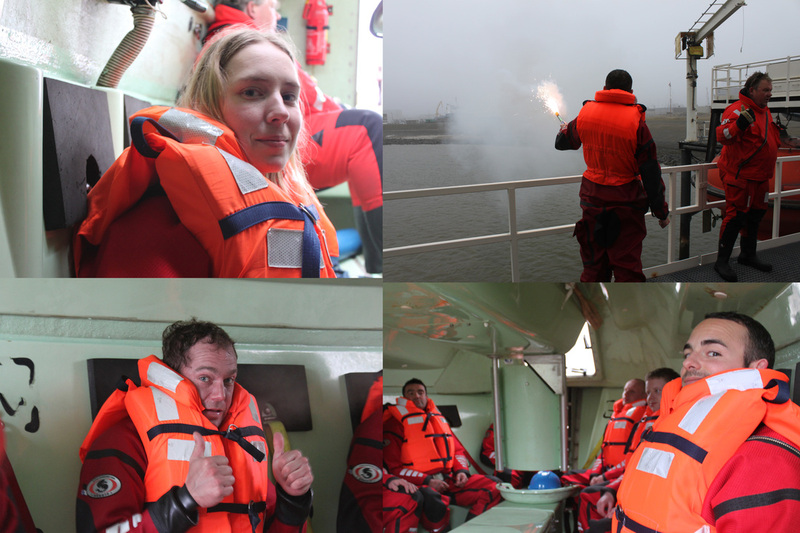 In the morning, the other participants (male, strong, mainly working off-shore) and me learned about hypothermia, lights signals, the danger of sea survival and the safety suits. In the afternoon, the program included our swimming session in the North Sea. The sea temperature was only 4 degrees! We got a rescue suit but this suit had no hand protection. We sailed towards the North Sea in a rescue boat, jumped into the literally ice-cold water and performed exercises to improve visibility for helicopters, learned how to swim in a group and embraced each other to minimize heat losses. We ended the session outside with some fireworks! After this cold session we could finally jump inside the warm indoor swimming pool. Here, we learned how to jump correctly from 4-5 meters, to climb down via ropes and how to access a life raft. This was also the last part of the program for me and Matthias. After some evaluation, we could finally go home and have some rest. 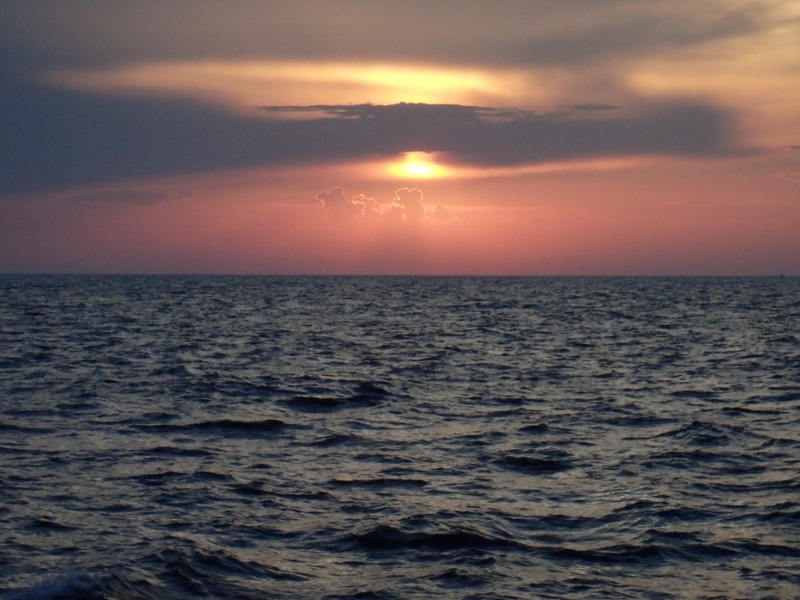 With this blog, we will inform you on our experiences on the Black Sea Cruise.